The Saturday night Topspiel Bayern v Schalke was Bayern’s big chance to close the gap at the top of the table to just five points after Dortmund managed to give away a 3-0 lead earlier today against Hoffenheim. It took Bayern just three minutes to test Ralf Fährmann with Robert Lewandowski backheeling a ball from inside the box in the arms of the Schalke keeper. That early chance said much about the start of the game Bayern seemed motivated to get the most out of the game after Dortmund had dropped points earlier. Bayern produced further chances. James saw a shot inside the box blocked in the 5′ minute, and David Alaba had a shot go just wide in the 6′ minute. The goal was only a question of time, and in the 11′ minute Robert Lewandowski broke the deadlock, at least that is what Bayern fans thought. The scorer was ultimately Jeffrey Bruma, but it was Lewandowski, who made the goal happen, the striker received a ball from James after he had won the ball in midfield and under pressure worked the ball into the box where Bruma ultimately toe-poked the ball past his own keeper. Relentless, Bayern kept at it. Serge Gnabry, after going one-v-one with Fährmann had the next chance (19′) but was stopped by Fährmann. The second goal was in the air, but it was not Bayern that would score it. Like it has been the case all season Bayern were prone to defensive lapses and in the 25′ minute, lost the ball to Weston McKennie in midfield. The US American spotted Ahmed Kutucu’s run, and the talented striker beat Sven Ulreich in the one-v-one situation. Schalke, however, had little time to celebrate. Gnabry won the ball deep in Schalke’s half and spotted James, who in turn laid the ball off to the completely open Lewandowski and the striker made no mistake to get Bayern back ahead in the 27′ minute. Those, who hoped that Bayern would settle the game were somewhat disappointed. 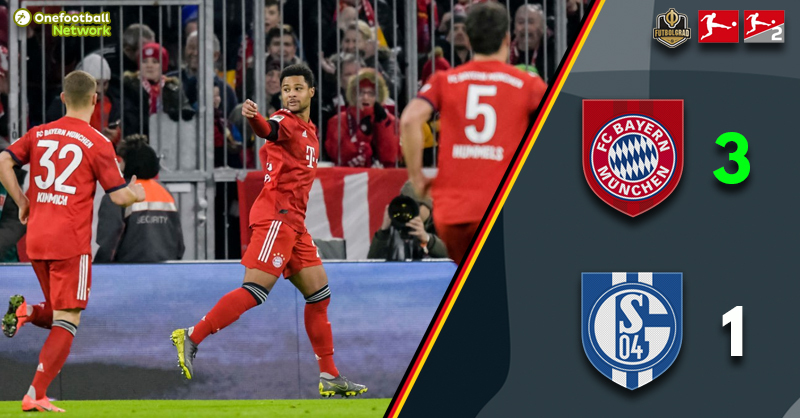 Bayern had further chances and were dominant, but Schalke created chances and had the biggest one through Yevhen Konoplyanka in the 35′ minute. It was an odd first half overall. Bayern were dominant and should have scored more, but their vulnerability in defence also meant that they were lucky not to have conceded a second. Hence, there was almost an apprehensive among the majority of the fans inside the Allianz Arena. An apprehensive feeling that intensified when Schalke started to produce chances. In the 52′ minute, McKennie slalomed through Bayern’s defence and after chaos in Bayern’s defence, Konoplyanka was first stopped by Ulreich and McKennie hit the post from close range. Two minutes later Schalke hit the post again this time it was Bruma after a corner. The equaliser was in the air. Instead, it was up to Bayern to score. 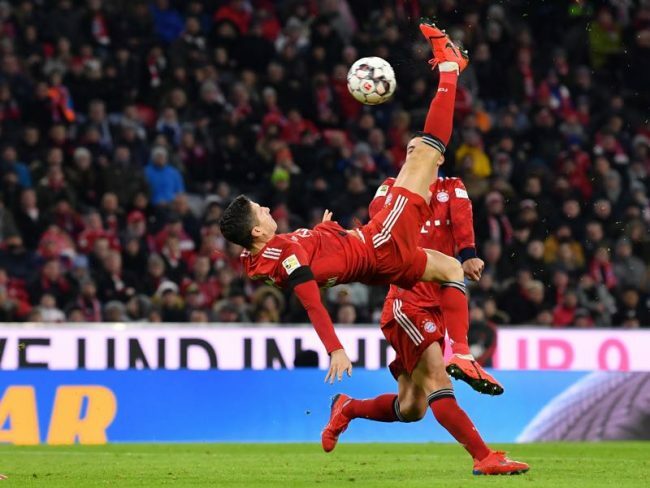 Lewandowski stopped a cross with his chest and attempted a bicycle kick that was not targeted well, but Gnabry reacted quickly to redirect the ball to score Bayern’s third in the 57′ minute. Although Schalke did not give up the goal more or less settled it, Lewandowski, in fact, should have had Bayern’s fourth in the 76′ minute after he was left wide open in front of goal, but his effort curled past the far post. Remarkably it was the final big talking point of the match as Bayern managed to settle down its defence and Schalke, in turn finally, lacked the quality to get back into this game. Robert Lewandowski was the man of the match. While the 30-year-old was not credited for the first goal, it was his effort that led to the opener. He then quickly scored after Schalke equalised and was also involved in Bayern’s third goal. In fact, if there is one thing the striker could be faulted for tonight is not having scored more, as he had at least two chances in which he should have scored. Nonetheless, Lewandowski once again highlighted his worth to this Bayern side. Bayern’s main problem remains defence. Every single Schalke attack meant red alert in Bayern’s third. Even with Bayern absolutely dominant, there was always a sense that Schalke could capitalise from one of the many mistakes committed by the backline. In this form, Bayern will struggle against teams that press harder and have more quality in the attack. Joshua Kimmich played his 100th game in the Bundesliga today. Since his debut, only Thomas Müller (36) assisted more goals than Kimmich (22). Bayern are now undefeated in 18 competitive fixtures against Schalke. James had the most touches (59), created the most chances (5) and fired the most shots (3) in the first half.